Currently in development as the setting for an independent pen & paper role-playing game, "Mortasheen" is a world I've been populating with my own original monsters since almost as far back as 2003; an impossibly vast, biomechanical city at the apex of a toxic, irradiated world, Mortasheen is populated by mad geniuses and otherworldly mutants whose daily lives revolve around the bio-engineered monsters they modify and train. It's lawless, polluted and impossibly dangerous, but it's a world that also exists in surprising harmony. Its average citizen may be an aggressively bloodthirsty, venomous parasite, but that doesn't mean they're bad. 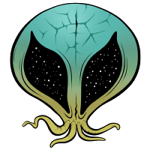 Below is a link to every monster in Mortasheen's current canon, illustrated by myself. Dating back over a decade, the art and writing quality as well as the level of taste may vary wildly; new monsters are currently added almost every month, while older monsters are selectively rewritten and sometimes redesigned. It's a never-ending project! Patrons pledging just a buck a month can see in-progress concepts, offer feedback on future monsters, view secret sketches, get early sneak peeks at RPG content, and help me put food in my organs! NEW! Browse monsters in order of the latest added, all the way back to 2011! Bioconstructs are the standard monsters genetically engineered by the denizens of Mortasheen as pets, protectors, laborors, food supplies or all of the above. Most today are fully organic, and categorized as Genezoa. SCRAP MONSTERS: Batches of canon monsters sketched out, named and described improvisationally! A faceless giant protected by its mobile "eyemoebae." A biological cannon with flesh-eating ammunition. A bony, amphibious hunter with a barbed antenna. A biological war machine engineered by minute extraterrestrial visitors. An asymmetrical skeleton henchman, one of the simplest to create and command. A monster with an unbearable visage. A lazy floating creature that induces sleep and invades dreams. A rubbery, dragon-like beast that can swallow and digest virtually anything. A lazy creature with hypnotic, mobile eyeballs. 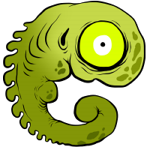 A slimy floating mutant that can see through the eyes of its prey. A long-clawed gremlin, fond of body organs. A scuttling skull with multiplying eyes. A magnetized monster able to secrete metal. A timid, faceless creature that can cause blindness. An amoebic, rat-toothed grave robber. A living trap that lies in wait for prey. A simple but reliable humanoid minion. A huge flabby mass that never stops eating. A cyclopean, clawed creature with a massive tongue. A dopey little creature with a deadly digestive tract. A flying serpent with highly disorienting attacks. A monster filled with narcotic chemicals. A walking piscoid swarming with disease. A large and powerful variation on the brekekekex. A monster capable of transferring thought and experience. A one-eyed mollusk with incredible vision. Grows a variety of hazardous, detachable head-tentacles. A monster with a huge heat-generating cranium. A saw-jawed, fast moving monster. A cartilaginous giant with a killer voice. A smaller, serpentine cousin to the Shreeg. A ridiculous-looking creature with a lethal tongue. A broad category of amoebic, unstable tissues. A monster with electrical tentacle-heads. An "evil eye" with mysterious connections to the ultimates. A giant, rampaging tumor with a special friend. An hairy beast that "sneezes" fungal spores. An armored land-eel with a bladed tail. An oozing mass of worms that can detach and re-form. A slimy, electrical salamander-like monster. A vicious salamander with accelerated healing abilities. An amphibian serving as a wasp's nest. A sluggish reptile with a festering bite. A venomous street-lizard with ambulatory hair. A mutant toad with mime-like psychic powers. An amphibian monster controlling a massive colony of young. A froglike monster with edible entrails. A gangly lizard that tortures its prey. An eater of the sick. A spiny desert lizard with dangerous blood. A blind, sewer-dwelling crocodilian monstrosity. A winged being with exceptional sight. A viciously taloned, prehistoric throwback. A small, leathery flier that rains acid on its prey. A monster with fast-growing bramble-like limbs. - flightless terror of the arctic. An armadillo-like monster capable of launching itself. A disgusting ape-beast with a more disgusting attack method. A marsupial mutant with a terrifying stare. A tiny monkey with massive, blinding eyes. A foul dancing equine who spreads a filthy fungus. 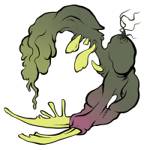 A noxious floating monster that spews infectious fungus from its hollow antlers. A camel-like monster infested with symbiotic fleas. A rodentlike monster that functions as a recycling system. A stinging, sandstorm-brewing "worm otter." A fierce jungle ape with a huge, false face. A tremendous, bovine mutant engineered for the food industry. An anteater-like monster that breeds stinging ants. A large and ugly four-legged beast with horrendous breath. A blind but lethal canine mutant. A giant canine with a coating of parasitic insects. A tiny creature with a gigantic second skeleton. A long-nosed, hyperactive "weasel dog". A club-tailed mole with a deceptive snout. derived from entirely human genetic material. A silly-looking but dangerous creature that lives in its own skull. A crusty, oozing creature that can petrify its foes with its own flesh. An idiotic mutant playing host to parasitic earwigs. A multi-armed head that petrifies its prey. A fat, floating monster with an immense maw. A dual-headed monster who "burps," if that's what you prefer to call it. A creature who cultures Fectoid-class monsters on its head. A fat, hungry humanoid that cocoons prey in saliva. A filthy humanoid who weeps foul-smelling ooze. A being encrusted with infectious, cancerous warts. A dripping, blobby creature that melts and absorbs skin. A pus-spraying, pus-drinking heap of bacterial polyps. A flat, scabby creature infested with mites. human-animal hybrids originally engineered by vampires as underlings. A "golem" of barnacles with a bizarre hidden power. A brutal, flightless mutant bat. A hunting-bat engineered by human vampires. A mutant bat with a built-in "stoplight". A sticky, electrical catfish mutant. A ghoulish hermit-crab like monster. A gigantic, living weapon of mass destruction. A scarred, floating being with lethally versatile blood. An evolution of the nanomonsters that run much of mortasheen. The most ancient bioconstructs, Abiozoa incorporate both organic and inorganic compounds, especially internally, possessing mineral, metallic or even plastic components. They are capable of self-replication when enough raw materials are available, but rarely do so, and are known to have indefinite natural lifespans. A creature with vicious whip-like limbs. A fast-moving, blood squirting torturer. A small but deadly iron maiden. A mind-stealing biological communication system. An eerie, floating entity dripping with psychotropic parasites. An immense cyclops of dripping tar. A monster whose frightening appearance belies an infectious cowardice. A sac-like piper with a maddening melody. A masked war-beast with corrosive breath. An elephantine cousin to the gasjack. A slimy candle-like monster fueled by a "cold" fire. A tombstone-like monster with a flock of grisly guardians. A conical executioner with a deadly gaze. An ornery, razor-toothed bundle of bandages. - larger, yet dopier cousin to the graunch. A needle-beaked mobile blood bank. A corrosive, mop-faced sanitation engineer. A vaporous monster with a vegetable-like shell. A brilliant(?) imitation of the lowly human race. A gluttonous biological washing machine. A living trash disposal system. 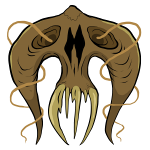 A masked monster with tentacular chains. A monster created to trim grass, people and other unwanted growth. An intelligent endoskeletal system for use with slimes. An intelligent exoskeletal system for use with slimes. A living restrainment and execution device. A moldy, madly chattering construct of bone. A many-tentacled toilet for those desperate moments. A gangly humanoid mutant with massive scissor-like limbs. A stealthy stalker with a mind-dampening aura. - it is what it eats, which is poison. A hollow monster who generates intense heat. An artistic with its own special "paint." don't breathe the fumes! A mustachioed monster who whips others into shape. A larger, more defensive cousin to the smoldron. A masked mutant with a mind-altering poison. A gargantuan humanoid with a modular mind. A serpentine skeleton with dozens of venomous barbs. A beak-nosed monster with virulent exhaust. - the ultimate predator, a chainsaw with feet! A giant variation of the chainsaw kid. A small, winged variation of the chainsaw kid. - burlier, grumpier precursor to the artilleraid. A huge, ravenous stone monster once revered as a god. A bear-like bodyguard who manipulates emotion. A ridiculous, filthy sock-like monster. An eerie cross-shaped creature that can injure from a distance. A "jack in the box" who invades the mind. A peaceful little monster who absorbs the pain of others. A baglike monster which can temporary change bodies. A doll-like monster stuffed with parasites. Similar to the "Shades" who populate Mortasheen city, Demishades seem to reflect every other monster class. A shade that controls vermin. A shade that suppresses knowledge. Capable of either curing or worsening disease. A handyman in a can. A powerful fighter...or at least its skin is. These legendary mercenery monsters each possess a single mind across countless replicant bodies. A gunslinger with sharp reflexes. A ruthless and almost uncontrollable speed demon. A toxic entertainer and artist. A mad inventor who can animate dead matter. An insidiously deceptive business dealer. A master chef and chemist. A brilliant surgeon and healer. An assassin with an arsenal of venom. A seductive but pretentious siren. Arthropoids are genetically engineered hybrids of human and arthropod, combining the size and intellect of the former with the many unique adaptations of the latter. - solifugid or "camel spider". These ancient, telekinetic bloodsuckers evolved from natural organisms under the influence of a bizarre and complex virus in the deepest depths of the sea. It is only in recent eons that these ageless, enormously intelligent monsters have begun to emerge onto land. A toothy, floating fish with an unusual lure to attract prey. A mesmerizing little fish with a huge, stalked mouth. A living trap with mobile bait. - based on a true pumpkin. A fish vampire with elaborate, electrical jaws. 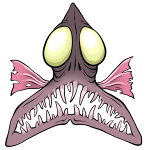 A small fish vampire with an edible luring mechanism. A bat vampire. how unusual! - the ultimate vampiric entity. A Botanical-class monster is an almost seamless integration of animal, fungus and plant tissues, cultivated parasitically from natural plant life. 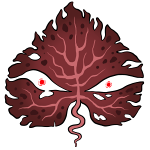 A cactus-like monster with both real and psychic thorns. A sedentary pod that generates its own toxic, parasitic drones. A parasitic stalker that weeps a burning onion-like juice. A peculiar-looking weed that drips a potent drug. A nasty toxic plant with powerful jaws. A walking bulb with dangerously intoxicating nectar. A moisture draining, pumpkin headed monster. 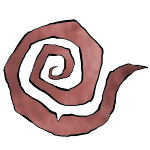 A cyclopean flower with strange psionic powers. A clawed, acidic monster with a deceptively pleasant voice. A fat, walking tuber with siezure-inducing eyes. A head-hunting hallucinogenic pitcher plant. A floating, colonial predatory plant. A creature with little more than winding limbs and big, slimy lips. A stinging parasite with a potent effect on vampires. A many-headed monster with ambulatory eyes. A swampy, rotten breeding ground for diseased mosquitoes. A reeking little flower with a curious effect on the living dead. A tree-like mutant with petrifying fruit. 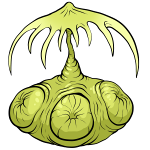 A burrowing, dragonlike predatory root system. An appetizing root system with a formidable flowering form. A tiny, flammable explosive monster. A massive cucumber-like explosive monster. While the typical Botanical is an animal, plant, and fungal trio, the Fungoids forego plant matter for an ainimal-fungal hybridization alone. A hungry, bug-eyed blob of fungoid tendrils. - "black mold" counterpart to the mildoom. These semicorporeal, seemingly unkillable entities are found in crystallized hibernation deep within the planetary crust. They are theorized to result from ancient experimentation in the artificial extension of life. An enormous, many-mawed burrowing Ectosaur. A large Ectosaur with infectious slime. A tunneling, cannibalistic Ectosaur with the most powerful jaws of its kind. An ectosaur with an expansive stomach. The largest and mightiest of all Ectosaurs. A gluttonous, ghostly ambush predator. An Ectosaur with retractable, roaming jaws. A speedy, electrically charged Ectosaur. All known Homo sapiens metamorphose into the mindless, generally harmless bioforms known as "zombies" following brain-death, but many stranger, more dangerous creatures can arise in the rare case that these shambling corpses successfully reproduce. A strange little mutant formed from a placenta. A rogue brain that has evolved into a mental predator. 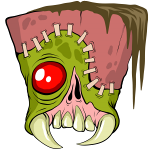 A freak merging of zombie and gastropod. A bloated, ravenous festerling variant. A fanged, aggressive festerling variant. A crawling, pathetic festerling variant. A stomach that has evolved into a gluttonous monster. An oozing, floating pus creature. A one-eyed heap of miscellaneous meat and bone. A tree grown on an extra-special fertilizer. 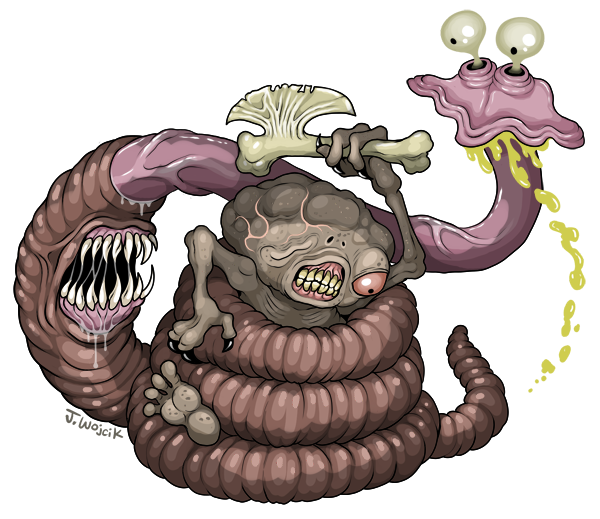 A carrier of mind-controlling worms (see the "wormbrain" class). An overgrown head filled with worms. A floating mutant protected by flies. A hulking mutation of the debilitwitch. 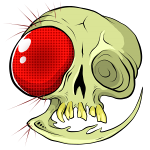 - the ultimate zombie/insect conglomerate. A bulky, crawling zombie spawn with toxic gas. 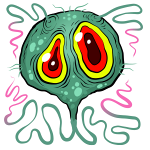 An amoebic, chaotic zombie offspring. A powerful, highly evolved mutant embryo. A titanic, sloth-like mutant embryo. A ferocious, taloned mutant embryo. A speedy long-limbed zombie spawn. - the perfect being, or still incomplete? Emerging from slimy, colorful subterranean hives, the origins of Jokers are entirely unknown, but they seemingly live to perpetuate chaos and disorder, their very consciousness housed not merely in a brain, but in the colorful, intoxicating gases swirling through their rubbery bodies, their minds as incomprehensible as their behavior. A weak, lowly wormlike joker. An exceptionally powerful, rogue Joker. A joker dwarfed by its own rolling eye. An exceptionally stretchy, squishy, electrical joker. A sweet, toxic Joker with a candy-like lure. 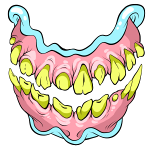 A joker made primarily of teeth and gums. A mad manifestation of the joker hive. A mollusk-like, slime generating joker. A saclike joker packed with venom. A powerful, many limbed joker with sinister powers. A ghastly limbless joker with a sharp, venomous snout. A tiny joker with a deadly acid. Many monsters defy any easy categorization, and may originate from other worlds entirely. "Unknown" both is and is not a proper class, but a miscellaneous designation for creatures believed to be of extradimensional or extraterrestrial nature. A massive and formidable genetimorph queen. A lecherous lady with toxic tendrils. A beautiful celestial being of unknown purpose and unpredictable behavior. - believed to be the luring mechanism of an unseen entity. A tiny but terrifying mental parasite. An abstract force that hides in electronic broadcasts. A weird floating entity with unusual molecular properties. A happy, smiling agent of fear. A metallic statue-like being with peculiar gravitational qualities. A thing of many small holes. An energy draining monster with light-warping wings. A collection of spore-like mineral structures that feed on intelligence. A flesh-hungry rock from above. A strange energy-drainer with telescoping arms. These horrific psychic weapons were engineered by an ancient civilization to punish behaviors they deemed morally destructive. It is widely believed that the "birds" themselves contributed to their creator's extinction, and did not function entirely as intended. A feeble little creature that can exchange bodies with its victims. A bird that remotely parasitizes others. A heavily burdened creature that generates mysterious pearls. A tiny flying predator that preys on a common weakness. A psychic manipulator unaware of its loathsome form. An ultimate embodiment of slothfulness. A creature that perpetuates violence. - the devil bird of delusion. - the devil bird of cruelty. - the devil bird of ignorance. - the devil bird of hate. - the devil bird of despair. - the devil bird of paranoia. - the devil bird of cowardice. An accidental creation with oddly pleasant attacks. - the devil bird of lies. - the devil bird of death. - the devil bird of knowledge. 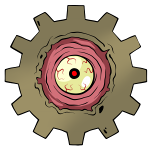 Integrating organic and electronic systems, Biomecha are self-replicating machines regarded by some as far superior to fully biological monsters. An intelligence node and information gatherer. A spindly creature designed to collect raw materials. An asymmetrical medical and repair unit. These monsters were engineered by a collective of sentient brain flukes as specialized host bodies, each Wormbrain essentially a vehicle for a hive mind of parasitic worms. A sluggish but durable wormbrain. A powerful and savage worm carrier. A simple, basal parasite host, the ancestor of all modern wormbrains. A repeating chain of small, suicidal wormbrains. A simple, common hominoid wormbrain. A massive, slug-like paraseethe variant. A small wormbrain with detachable, mobile eyes. A Gasper with poisonous breath. A single worm with many hosts. These advanced biological weapons can dissolve their bodies into billions of infectious nanomonsters and reconstitute from host bodies, effectively transforming between a macroscopic monster and a microbial disease at will. causes brain degeneration and epidermal mold. causes nausea, disgust and dysentery. causes stinking slime secretion and indifference. A microbial puppet-master and fectoid "queen." - causes sorrow and explosive boils. An exponential and explosive parasite. - causes fearfulness and rigor. - causes an outgrowth of unstable bio-organic weaponry. Garbage-class monsters are those creatures which have arisen spontaneously from the biochemical run-off of Mortasheen city, created accidentally with every new genetic experiment and sometimes multiplying out of control. While usually harmless, their unpredictable genetics can imbue rare individuals with surprisingly deadly powers, and some strains are capable of metamorphosis into far more formidable "garbage beasts." An upside-down creature which feeds through its posterior. An oozing bucket of scum. A cowardly, pus-filled, dog-faced creature. A sticky bag of organs. - its large and active brain is unfortunately useless. 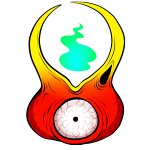 A strange monster blinded by its own thick mantle. - eats and eats, until it pops. An eye with a discriminating attention span. A peculiar walking spinal cord. A set of flapping, filthy ears. A dim-witted and clumsy little monster. - has a stupid, tiny head. A creature perpetually eating itself. - looks good, smells good. not good. A crawling, groping fish-faced monster. - ugh, get it off! A shy, perfectly flat monster. A creature encased in a ball of limbs. An inverted, overly affection subhumanoid. A fast-moving, spidery creature made of fingers. A mite-like monster that scuttles on its mouthparts. 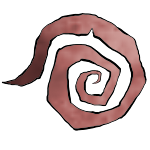 A gnarled, twisted and fatally self-conscious little creature. A gassy, floundering reptilian beast. A vomiting slug with oversized eye stalks. A prickly but fragile creature. hides in its own ribs. An upside-down suction cup baby. eats its own waste, over and over. doesn't understand this "defense" thing. A peculiar creature that must drag its own mouth. An organic sonar dish with nothing important to broadcast. A somewhat obscene, backwards monster. A fishy being that tends to drown itself. A headless, chickenlike thing that never stops screaming. rolls about inside its own huge blister. A monstrosity with toxic blood. A beast with infectious heads. A rancid trash creature with a shell of metal scrap. A floating, vomitous fish-like monster. A rancid, fish-like trash creature. A twisted, reptilian monstrosity with poison-spewing entrails. A shape-shifting mass of saw-toothed bodies.